So, as you know, for over a year, I have been trying to grow my natural hair to hip length from waist length. My length retention has been slower at this length, which is typical (the longer your hair is, the harder it is to retain length). I was getting a little frustrated and knew the devil was in the details, or in this case, the wash day. 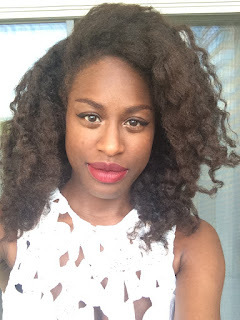 But my wash day has been fairly consistent for two years now (the products change, but the same technique has remained the same), and I was hoping that I would see success by changing my day-to-day regimen instead. 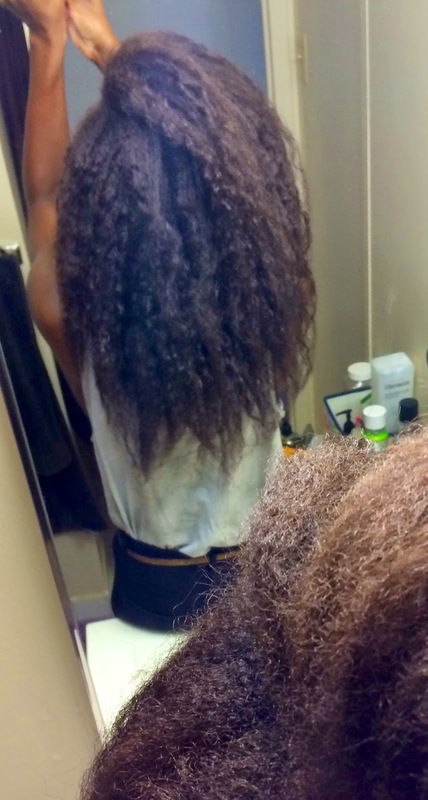 My wash day regimen from when I big chopped up until I was bra strap length is very different from my wash day today. For one, despite having shorter hair, it was significantly longer due to pre-pooing, washing, conditioning, deep conditioning, detangling and then moisturizing and sealing. And for another, I did it two to three times a week. A fairly short lived technique during this period was saturating my hair with conditioner and detangling before I got in the shower, as well as washing in two strand twists to prevent breakage. Both were short lived because, well, they added extra time on to my wash day as opposed to decreasing it. I was also very heavy handed with products back then, so I could easily run through conditioner in less than a month. So neither technique was useful at the time, and I was also still gaining length, so they weren't deemed as necessary. Fast forward back to this week, and I thought they may in fact be perfect for incorporating into my wash day now...and also be the key to finally making it to hip length. It would work in my regimen for a few reasons: I am no longer heavy handed with any products and know that less is more, I have a bunch of conditioner laying around that needs to be used up, I know that detanlging my hair stretched and "dry" is faster than detangling in the shower with soaking wet hair, and because my hair is longer, I don't have to do as many twists for them to stay twisted while I wash my hair. Last night, I finally put this into practice. So what happened...probably the smallest wash day hair ball I have yet to see. It was a little bigger than a quarter and very lightweight and sparse. I also lost very, very little hair while detangling "dry." My hair ball from this wash day compared to last wash day was half the size. So why did this work? Well, these techniques help to reduce breakage and manipulation during wash day (and for most naturals, a large amount of breakage occurs on wash day because the hair is weaker when completely saturated with water). Hair is stronger when it is dry (dry as in it's not wet, not dry as in your hair needs serious TLC) compared to wet. By adding conditioner, I am giving it just enough slip to be able to effectively detangle and remove knots. Washing in two strand twists ensures that hair is compact during the washing process and isn't free to get tangled or rub together to much. All of this translates into retaining more length, and hopefully, I will finally seeing some considerable gains in my hair length.